This DIY upcycled dog toy is the perfect way to treat your dog for any occasion, but especially during the holidays. Even better, the project is so easy your kids will be able to get in on the fun. Between our two dogs and our two cats, sometimes we truly feel like we live in a zoo! But we wouldn’t have it any other way. Over the years, our pets have become an important part of the family. Their companionship has filled our house with tons of love, laughter, and lasting memories. To show them we care, we love providing enrichment and special treats. As family members, our pets deserve a few special holiday gifts too! 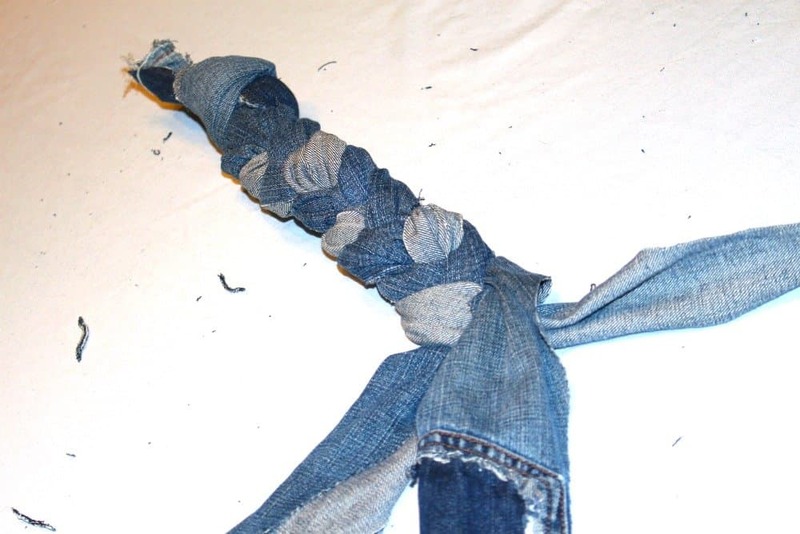 Whenever we have old jeans we whip up these super durable dog toys, which have become a household favorite. They are totally FREE to make and the assembly is easy enough that your kids can help! To begin cut out the 4 side seams and waist band on the jeans. To remove some of the remaining bulk, it is also best to cut out the pockets. Due to the thickness of the jean material, this step does require adult scissors. For this reason, this step is best reserved for older children. When finished you should be left with 4 panels of fabric. You will be using 3 of the panels for this project. Save the last panel for future craft projects. After cutting the jeans into panels, taper the top quarter and bottom quarter of each. This eliminates a lot of the bulk and makes the knot tying much easier. After tapering the ends, gather the three strips and tie a really tight knot at one end. You really want this as tight as possible, because your dogs will be pulling on this knot as they play. Next, braid the 3 panel pieces together. To make this step easier for kids, you can lay the project on a table and have them fold over 1 piece at a time. Keep the pieces spread out to help your kids stay visually organized throughout the process. If your kids are new to braiding and it seems a little lose, don’t sweat it. Pull firmly on the ends to tighten it up. Once the braid reaches the tapered portion of the fabric, it is time to tie your bottom knot. Again, tie this as tight as possible. If desired you can tuck the stray ends into the knots. As you can see, this toy is always a big hit! Happy holidays, y’all! This is a great idea! Denim is durable enough to make this work – and it’s totally a craft the whole family can get it on. Love it. My dog would love this toy and making it myself would save me some money. I’ve spent a lot on dog toys that my dog has destroyed. I think we’re going to go all out for our dog Peru this year. She could probably use a toy like the one you made because she loves to tear things up. lol Love your ideas for what to include in a basket. This is perfect or a feisty dog like yours! Wow! This is interesting. I don’t have dogs but this is something I will definitely recommend to my dog-lover friends. indeed innovative. Love the upcycle dog toy. My Wilson would love it! He likes laying on our jeans anyway, so might as well make something useful from them! My dog is quite the chewer and destroys practically everything that comes in contact with his mouth. Those beneful treats have been lifesavers for us. Too bad he also likes to bury them rather than eat them. We will find them weeks later stuffed between our couch cushions. Haha that is too funny! We’ve found toys in the couch, but never bones. We have two dogs and I will be making these for them! I hate spending a ton of money on toys that get torn up! Me too! A lot of times, even the ones that say indestructible don’t last but a day. Your pets are so cute!! 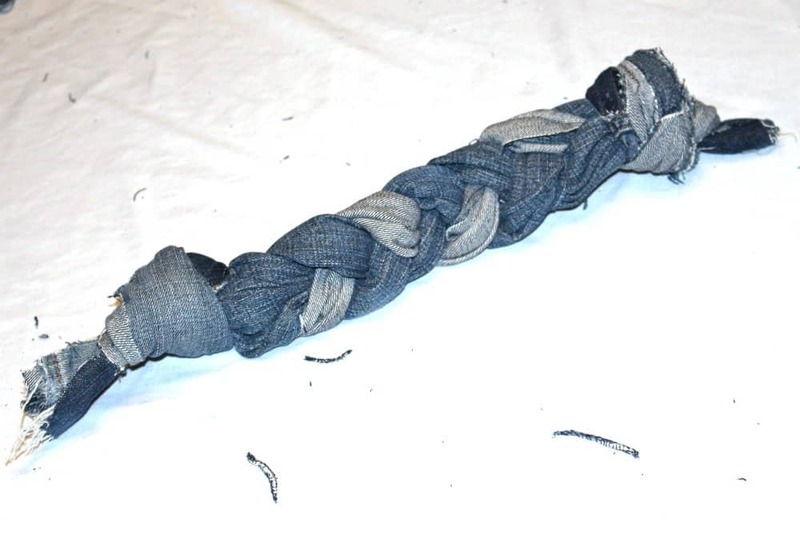 That’s a great idea to do DIY pet toys and reuse old jeans. I’m sure the dogs will be thrilled! Thanks! I’ll tell them you think so! These are perfect! 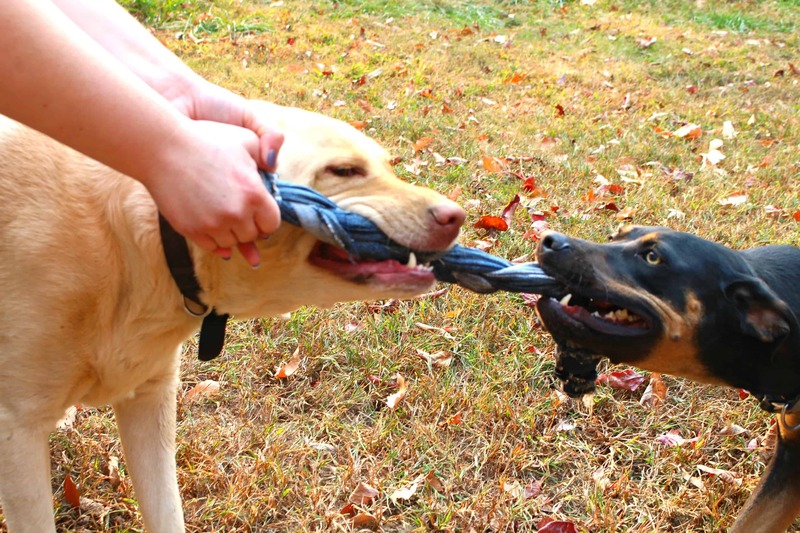 I have made the same kind of toy from leftover fleece and the pups thoroughly enjoyed playing tug of war with them! I’ll have to pull the jeans out of the donation box and upcycle them. Fleece is a great idea too! That’s such a cute idea! My childr3n would love to make something like this. This is so cool. I can make my dog a Christmas gift now! I’m so excited about this!!! That is such a smart idea to use old denim! I sometimes donate my old jeans, but this is a much better idea! I donate too, but the best part about this project is that you can use jeans that are too disgusting to donate. Omg what a cute toy!!!! I think my daughter and I will have to make one for my moms dog for a Christmas gift! Now that’s the Christmas spirit! I have so many old pairs of jeans that don’t fit anymore! I would love turning them into these! My pup would love it too! What a great idea, My puppy would love this and it wouldn’t cost me anything! That is such a great idea! I am going to try this as a gift for our pups. We like to put something in their stockings too! I love the idea of this and also makes sure that no old things go to waste. Great post!